Rice, wheat, beef, sugar, and dairy are called the “sacred five” in Japan, yet these industries have struggled recently. Inextricably linked to the country’s history and culture, the crops remain insulated from free market competition by heavy subsidies and tariffs on foreign imports—often upwards of 100 percent. Tariffs on rice imports may be the most egregious example at 778 percent. The tough times are partly due to the country’s inherent economic, geographic, and demographic constraints. 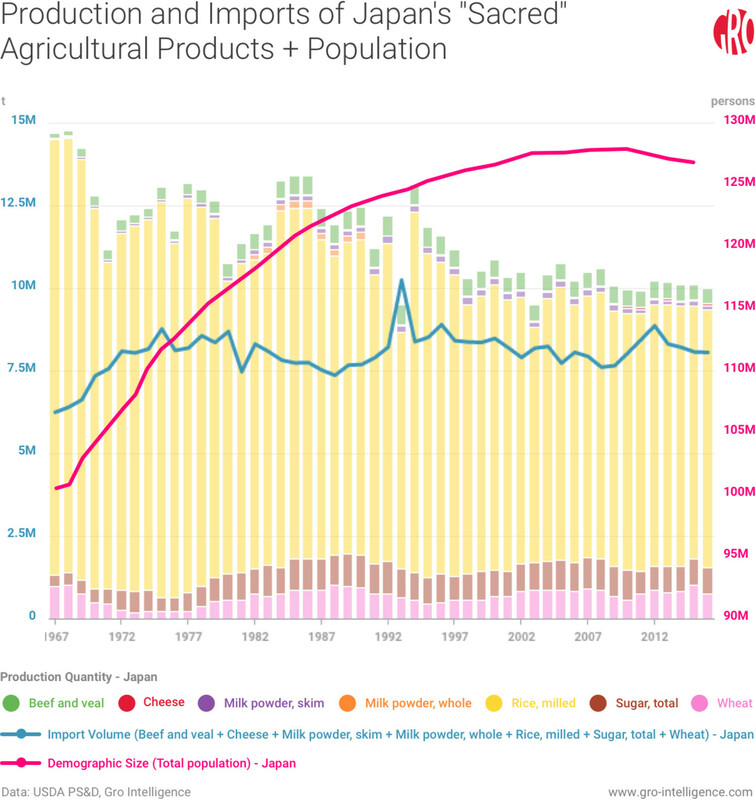 Production of Japan’s traditional agricultural products has dropped 32 percent in the past 50 years, while imports have risen 40 percent in the same period. Meanwhile, Prime Minister Shinzo Abe has aggressively pursued new free trade deals to galvanize Japan’s lethargic economy—despite four years of stimulus, the Japanese economy is only 2.2 percent larger (in real terms) than in 2012 when Abe returned to power promising growth through massive structural reforms. He’s also trying to secure vital new market access for the country in the face of its dwindling domestic population. Since the Trans-Pacific Partnership (TPP) has been trumped by growing populism in the United States, Japan has continued to pursue bilateral trade deals with its former adversary and others. Japan’s highly protected agricultural industry appears to be one of the main impediments to further liberalizing its economy. While the subsidized sacred crops have long been fiscally unsustainable, there have been recent flickers of hope for the country’s farmers: a weaker yen and a greater focus on high-quality commodities—such as apples, select beef, green tea, and whiskey—have lifted food exports by over 22 percent in the past two years. As Japan shifts away from the sacred crops, what can it do to ensure the future success of its agriculture industry? Nearly as soon as Western traders reached Japan in the 16th century, friction between the two cultures precipitated a closing of Japan to foreigners—a period of isolationist policies known as Sakoku. Although these policies existed nominally until 1866, the arrival of American Commodore Matthew Perry in 1853 quickly began to erode the enforcement of these practices. A period of intense modernization was soon underway. No longer shielded from the geopolitical influences and existential threats from the West, Japanese authorities moved to expand their nearly nonexistent manufacturing sector. While roughly 80 percent of Japan’s population were rice farmers during the Sakoku period, the need for factory labor during the Meiji Restoration drew droves of Japanese to the cities. Osaka, Hiroshima, and Nagoya, among others, quickly transitioned from seats of power for feudal lords to important centers for trade and commerce. After the Second World War, employment in agriculture still constituted roughly 50 percent of the work force. 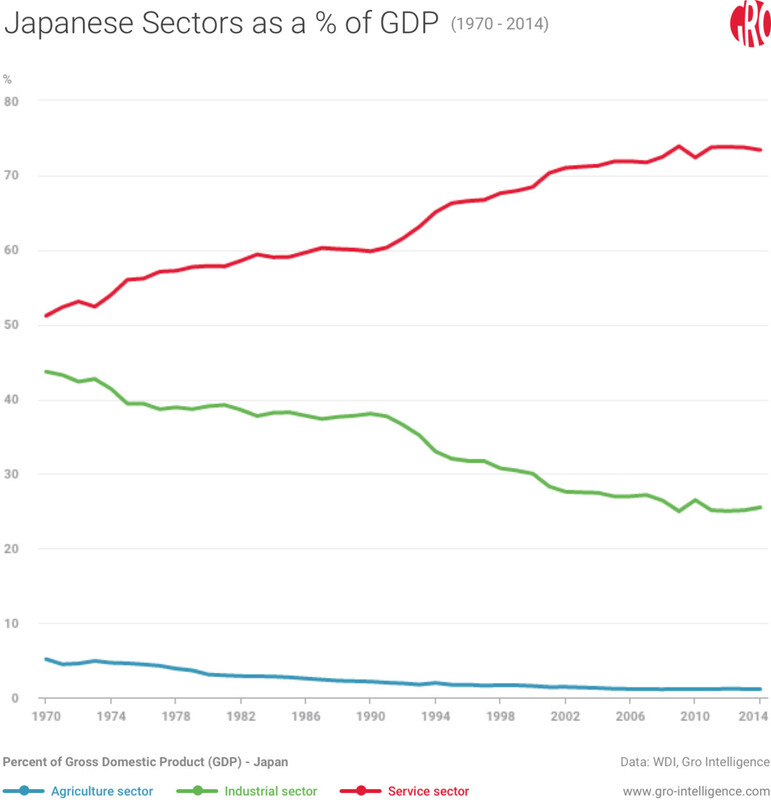 As the US began to invest heavily in the reconstruction of Japan, especially its manufacturing sector, employment in agriculture began to plummet—to 23.5 percent in 1965 and down to 7 percent by 1988. Lifted by especially strong manufacturing and service sectors, Japan reached a level of nearly unmatched prosperity by the 1980s. Japan entered a bubble economy in 1985 after the Plaza Accord led to the weakening of the dollar relative to the yen. Pyramiding levels of debt were used to speculate on stocks, real estate, and foreign assets. The bubble would continue to inflate until the Nikkei 225 stock average finally crashed in the early 1990s with losses of more than $2 trillion. The aftermath of the crash would be felt for over a decade as efforts to revive the economy between 1991 and 2001 failed. The era, known as the “Lost Decade,” would continue through the 2000s with the global recession. Abenomics was introduced with the re-election of Abe for a second term in 2012. Most importantly to agriculture, the third of Abenomics’ so-called “three arrows” has been structural reform and the aggressive pursuit of new trade deals, as Abe has explicitly said himself. 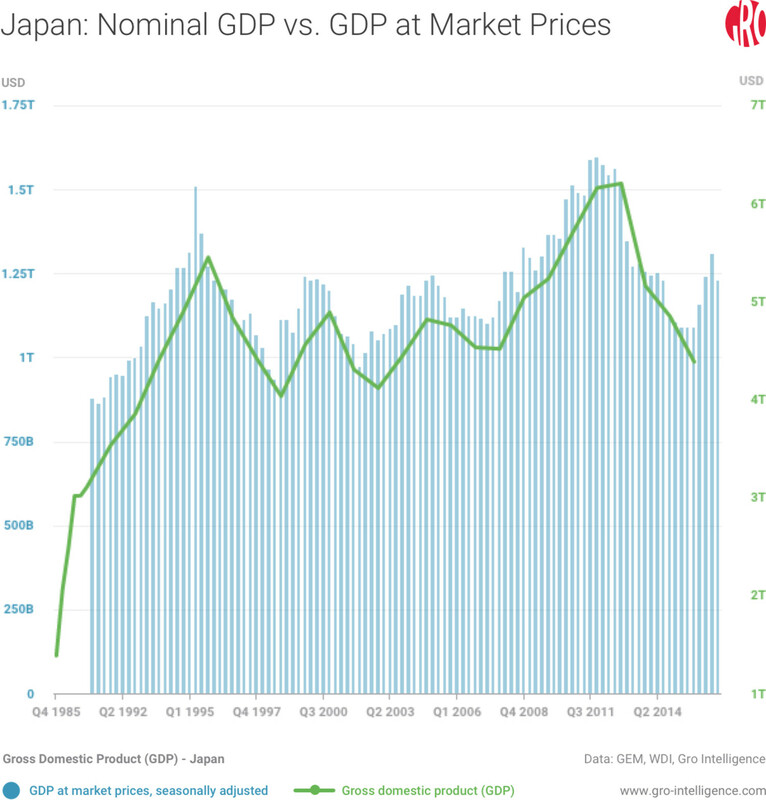 Despite four years of economic stimulus, Japan’s GDP has seen relatively negligible growth. The agriculture sector accounted for roughly one percent of that GDP down from five percent in 1970. The services and industrial sectors accounted for 72 and 27 percent, respectively. Japan’s rural population has declined from 28 percent to 6.5 percent during the same period. Simultaneously, the country’s population employed in agriculture has fallen to under 4 percent in 2013. 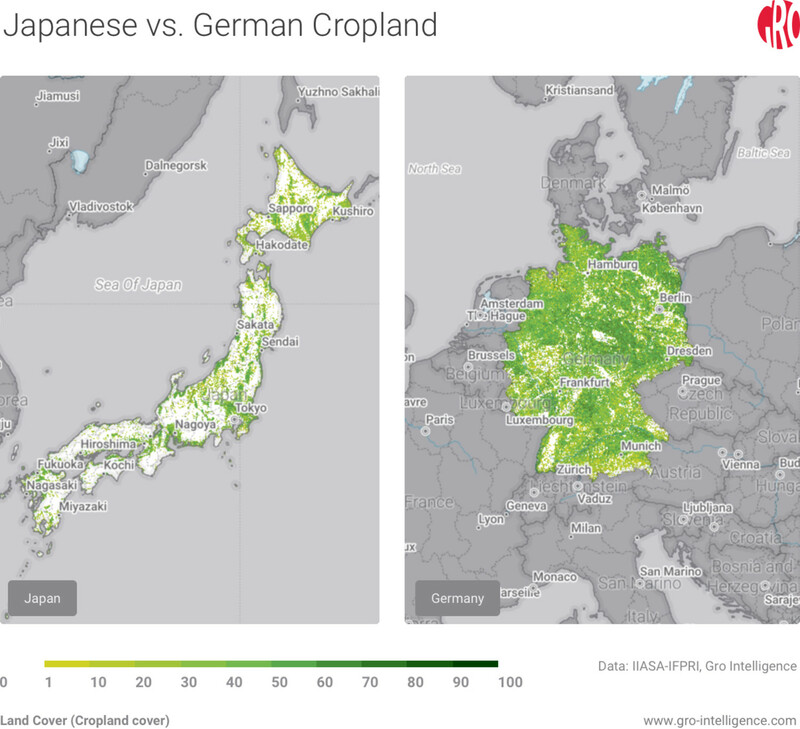 Japan, as one of the most densely populated countries in the world, is fundamentally constricted in further developing its agricultural industry. Japan’s history of isolationism and self-sufficiency was only possible due to temperate climates and fertile volcanic soils, but the resources needed to fuel the population boom post-World War II could only be acquired through imports. 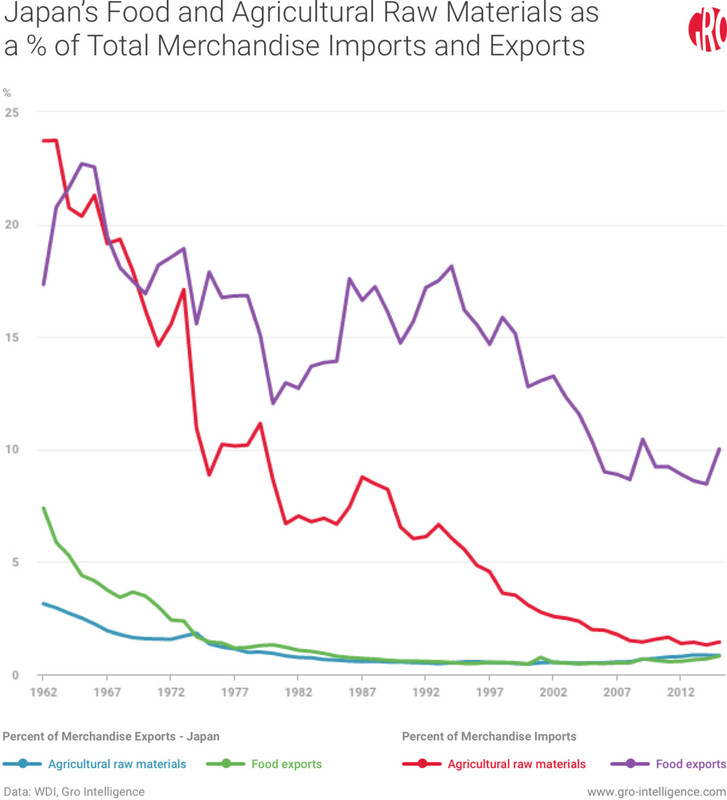 Today, Japan imports roughly $60 billion of agricultural products annually—the fourth-largest such importer. While Japan’s protection of its forests has been a boon to the islands’ biodiversity and fragile ecosystems, outdated regulations force the country to import lumber (about $10 billion net annually) from rapidly deforesting nations. 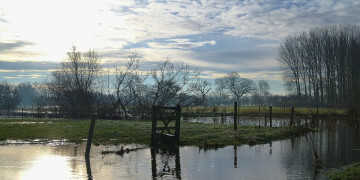 The policy also reduces the amount of arable land within its own borders. 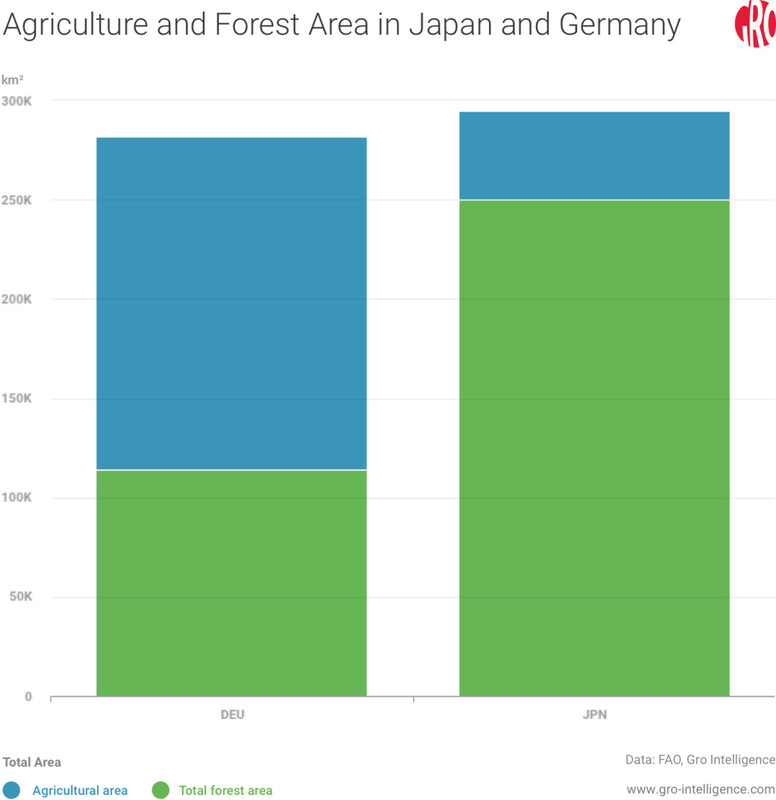 Japan and Germany, for example, are the world’s 61st and 62nd largest countries by area and the third and fourth largest economies by nominal GDP, yet they consist of 68.5 and 32.7 percent forested area, respectively. Although much has been made of Japan’s sacred five, industries that are relatively free of government interference show more efficiency. For example, seafood represents the largest food or agricultural export industry in Japan. Notably, unprocessed frozen fish and molluscs represent the two largest agricultural exports by value at $502 million and $482 million, respectively, in 2014. Even this bright spot, on average, has seen a gradual decline over the previous five-year period. While Japan’s bountiful waters continue to support its fishermen, farmers have been far less fortunate. Since 1970, production of the sacred five has decreased 22 percent—from 12.8 million tonnes to 10 million tonnes. Sacred five exports have dropped 63 percent in the same period—from 950,000 tonnes to 351,000 tonnes. Imports have risen by 10 percent despite the country’s dwindling population during that period. Considering the inefficiencies and high production costs in Japanese farming—rice farmers receive at least four times more per tonne than in neighboring countries—these trends are hardly surprising. Japan has found the most agricultural success in luxury and high-value added agricultural products by leveraging its skilled workforce and enforcing tough phytosanitary regulations. Rising incomes in East Asia have allowed more communities abroad to purchase imported food and beverages from Japan, which are often highly regarded for both their taste and safety. 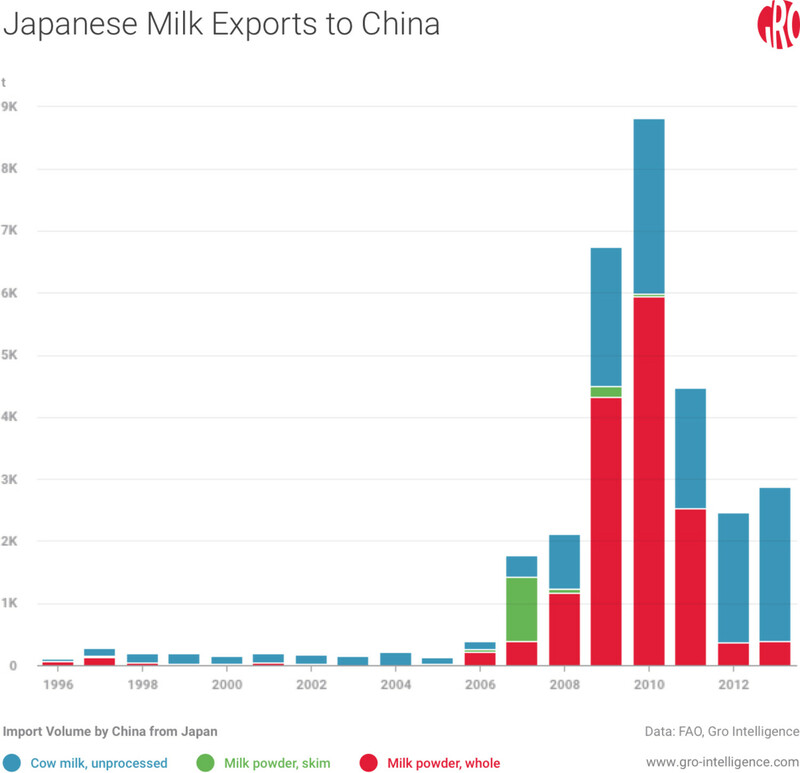 Following the 2008 Chinese milk scandal, in which mass quantities of milk and infant formula was found to have been adulterated with the toxic chemical melamine, Japanese exports of milk skyrocketed and have remained historically high since. 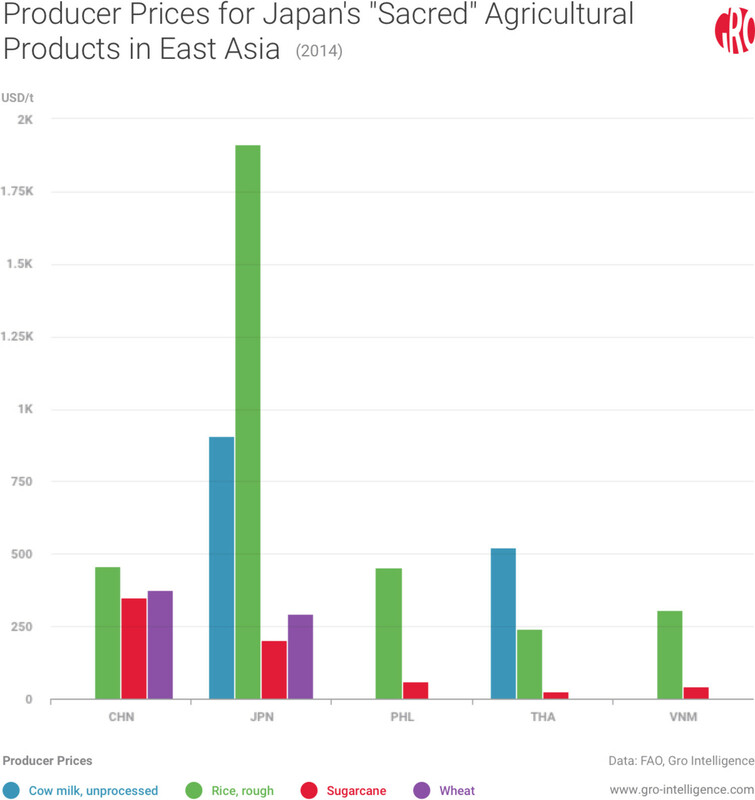 In 2015, Hong Kong alone imported 24.7 percent of Japan’s total agricultural exports. The highly-regarded quality of Japanese food and beverages has significantly helped to offset the higher production costs for other goods. With crops that can easily be branded as being uniquely from Japan—such as Fuji apples and Wagyu beef—the country’s farmers have seen notable increases in demand as populations within the region continue to exercise their newfound disposable incomes. It makes sense that the more processing and additional value Japan tends to put into these items—or the health concerns surrounding the item—consumers are willing to pay a premium for Japanese imports. Together these few high-value crops and processed foods represent the increasingly rare bright spots in Japanese agriculture, accounting for the majority of the 22 percent Japanese food exports jumped in the past two years. The largest obstacle to structural change in the country’s agricultural sector, the Japan Agricultural Cooperatives (JA), emerged in the wake of World War II. As a preventative measure to counter a potential black market for rice during a period of food shortages and rationing, the JA was backed by the government as a regulatory body. Overseeing insurance, banking, marketing, and the welfare of the 710 regional co-ops, as of 2012, the JA group is a powerful lobby group, with a voting bloc of 9.7 million members, that can push legislation to help subsidize crops or thwart proposed trade deals. The JA also acts as a wholesaler, collector, and retailer, which affects the pricing of staple crops such as rice. 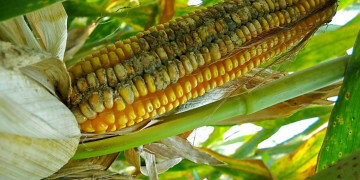 This policy leads to inefficient farming practices with low yields by farmers who are only growing crops due to the subsidies provided by the JA. With both stagnant growth and expenditures in mind, Abe has consistently pursued free trade agreements with many of his largest trading partners. Although the benefits of free trade deals and other economic partnerships are well known, Japan will benefit most from access to new markets, especially as the country’s population continues to both age and decrease. Abe is under heavy pressure to negotiate further market access with other large economies, especially its top export destinations: China ($131 billion), the US ($128 billion), and South Korea ($52.5 billion). Between 2006 and 2007, Abe oversaw free trade agreements with Chile, Thailand, Brunei, and Indonesia, while laying the groundwork for other pivotal deals with both India and the ASEAN group. Since returning to office in 2012, Abe has most notably secured a trade deal with Australia, which is projected to provide Japan with over $50 billion in trade gains by 2034 and a potential bump in total GDP. Of interest, Japan agreed to reduce tariffs on frozen and fresh beef to 19.5 and 23.5 percent over the next 18 and 15 years, respectively. 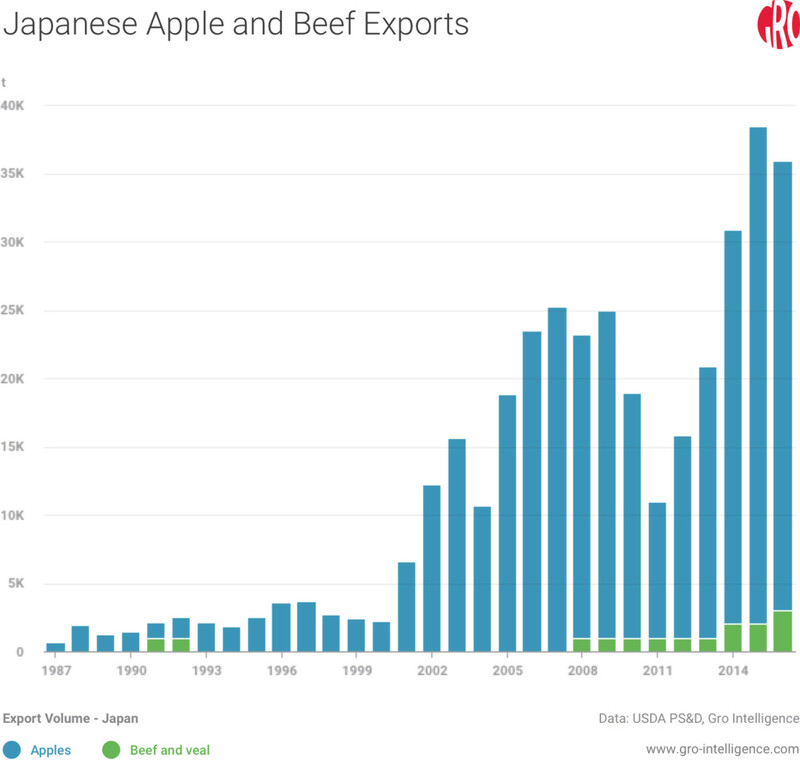 The recent surge in Japanese beef exports, mainly high-quality Wagyu beef, demonstrates the country’s ability to simultaneously reduce tariffs and increase exports by focusing on higher value commodities. The deal still leaves much to be desired with wheat, sugar, and dairy products receiving nearly insignificant tariff reductions, while rice tariffs went completely untouched. Within days of taking office, President Trump signed an executive order which signalled the end of the deal in its current state. The deal could be revised to remove the US’s required participation, but few expect this to happen. Meanwhile, Japan has been pursuing separate deals with its other largest trading partners.These talks have also been hindered by Japan’s inability to lower duties on agricultural imports, such as dairy. Japan’s farmers continue to vehemently oppose any new trade deals. Yet the number of farmers in Japan continues to plummet—from 14.5 million in 1960 to just over 2 million in 2015—and the JA’s non-farming members may not continue to vote against trade deals which may be in their interest. With Japan’s highly protected agricultural industry (along with its automobile industry) representing the main obstacle in securing new trade deals, it pays to ask how long Japan’s farming organizations and cooperatives can withstand the pressure to liberalize. During the mid-1800s, when Japan was threatened with encroaching and rapidly developing foreign powers, the country was forced to choose between modernization and further isolation. Although choosing the former led to a period of significant short-term instability, Japan quickly rose to become one of the world’s most influential powers. While Japan may be more constricted in regards to agricultural success than as an imperial power, its general economic well-being in the future may be more tied to agriculture than one might expect. Despite being the fourth largest exporter by value in the world, Japan’s exports of agricultural raw materials and foodstuffs combined for only 1.7 percent of its total merchandise exports in 2015. 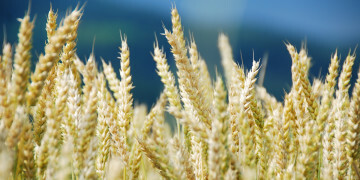 Although deft political maneuvering may help the protected groups within the agriculture industry avoid the inevitable structural pains, it seems likely that Japan will need to continue removing tariffs on fiscally unsustainable crops, especially the sacred five, as it pursues new trade deals and expanded market access for exports. Japan may need to start subsidizing retraining programs and help farmers switch crops to some of the exports which have seen success in the past few years to ensure their long-term success. Japanese officials could also start to loosen draconian laws on migrant workers to help the relatively successful farmers whose growth has been hampered by labor shortages. Moreover, with 63 percent of the country’s 2.1 million commercial farmers currently 65 years or older, Japan will need to make significant improvements in attracting its youth toward the sector. Just like the tough decisions made in its past, if Japan hopes to have a sustainable agricultural industry contributing to a healthy diversified economy in the future, officials will need to form a multi-party consensus to confront some of the traditions that are limiting its global potential before it’s too late.